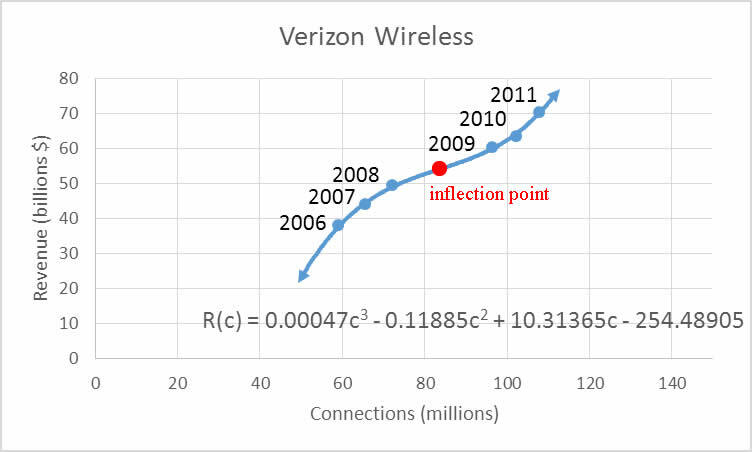 From 2006 through 2011, Verizon Wireless has grown steadily. The table below illustrates the growth in revenue as well as connections (phone numbers). 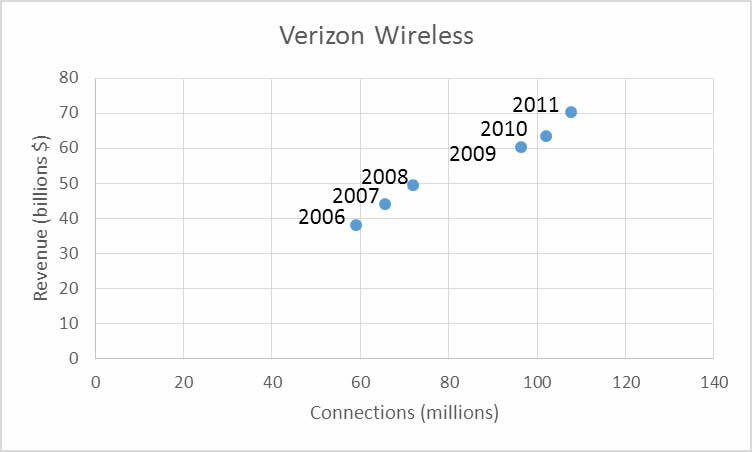 Let’s examine the relationship between connections and revenue by graphing them in a scatter plot. If the independent variable is the number of connection in millions and the dependent variable is the corresponding revenue in billions or dollars, we get the scatter plot below. When we place the model on the scatter plot, we see that the model fits the data well. The cubic model has an inflection point. On the left side of the inflection point, the revenue is rising at a slower and slower rate. This means the slopes of tangent lines get smaller as they move from left to right near the inflection point. The graph is concave down on the left side of the inflection point. On the right side of the inflection point, the graph increases faster and faster. In other words, the graph gets steeper and steeper. This results in the graph being concave up on the right side of the inflection point. Label this point on a second derivative number line. Now test points on either side, at 50 and 100, to find the sign of the second derivative. Label the number line with – and + to indicate the sign of the second derivative. Now we can label the concavity on the number line. Since the concavity changes at approximately 84.3, it corresponds to an inflection point. Its position on the graph is found by substituting 84.3 into the original function. Previous PostHow Do You Find The Inverse Of A 2 x 2 Matrix?Next PostHow Do I Use Microsoft Office To Create A Matrix?